Here's fan filmed video footage of KISS performing "I Love It Loud" at Hellfest in Clisson, France, on June 22, 2013. 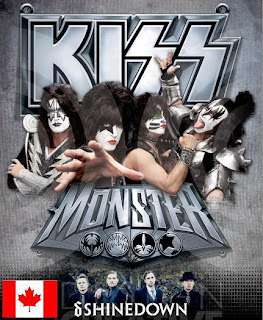 This was KISS' last show of their European leg of "Monster World Tour 2013". KISS will kick off the Canadian leg of their "Monster Tour 2013" on July 5th in Victoria, British Columbia, Canada. Opening act for KISS on this tour will be the band "Shinedown".